Should My Dentist Have a Diode Dental Laser? Shown here is the tip of a diode dental laser. 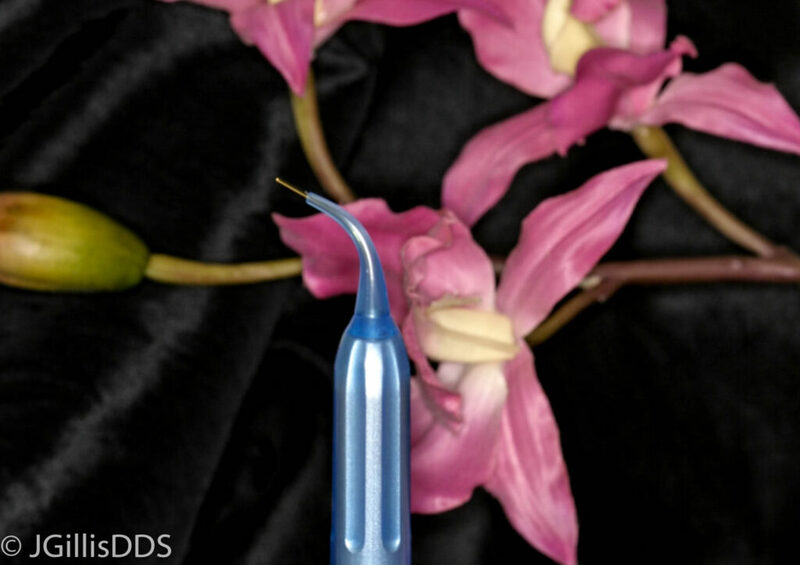 Because the tip is so small and delicate it can get comfortably below the gums to remove bacteria there. LASERS HAVE BECOME SO COMMON THAT MANY PEOPLE HAVE FORGOTTEN WHAT THE WORD LASER EVEN STANDS FOR! AND, THAT IS LIGHT AMPLIFICATION BY STIMULATED EMISSION OF RADIATION. Diode dental laser in action. 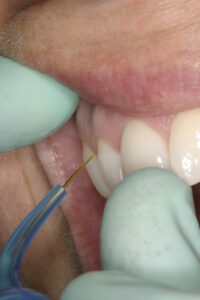 Shown above is the tip of a diode dental laser. Sweet looking isn’t it? Our office uses a diode laser many times daily. Our hygienists can swipe the tip of the diode laser just below the gums and gently and painlessly kill all the bacteria that are hanging out there causing gum disease. The laser stimulates healing too. This patient is “tongue-tied” with a strong frenum attachment made it so our patient could not lick her lip or stick her tongue out. Easily treated with a diode dental laser. Our office uses a diode laser to speed the healing of cold sores and ulcers that are common in people’s mouths. The pain from cold sores or ulcers is reduced or eliminated after just one treatment with a diode dental laser.And, the laser doesn’t even touch the sore! By using a diode laser to do many kinds of dental surgeries, we have improved success and less discomfort compared to traditional dental surgeries with a blade. The diode laser is kinder to tissues, stimulates healing, and allows surgery with no or very little bleeding. laser speeds healing and decreases pain. Cold sore area a couple days after treatment. with a diode dental laser. These surgeries and many others are easier and more comfortable with a diode dental laser. If you would like more information on this topic or any other dental topic we would be happy to see you in our Western Colorado dental office. Our office phone number is (970) 242-3635. Please visit our web site at www.juliegillisdds.com for more information!